Are Skinhibitions holding you back? There comes a point in every woman’s life when no amount of beauty products or water consumption will bring back the dewy, supple skin of her youth. Most of them will try anything regardless, relying on an arsenal of techniques that range from the uncomfortable to the unthinkable. They quickly find that repeated slapping, hanging upside down and crusty green masks stimulate nothing but laughter from whomever they live with. Ironically, these women—who are so willing to try everything—have an overwhelming fear of professional skin treatments that promise real results. About 75% of women report being unsatisfied with the appearance of their skin: they desire a cosmetic procedure that delivers results, but have legitimate fears about pain, downtime, side effects and costs. Their Skinhibitions are holding them back. Active oil production gives skin its dewy glow but also causes breakouts and, as a result, acne scars. Wearing protective armor, such as sunscreen and eye cream, and adopting a healthy lifestyle are the first steps toward preserving a youthful appearance. Avoid partying into the late hours, smoking, sun tanning and yo-yo dieting—the cumulative effects will show up later in life. It suddenly takes a lot more work to look the way you want. Once women hit 40, it’s easy to tell who’s been taking care of their face and who hasn’t. Skin is drier, thinner and less firm because lipid and estrogen levels have dropped. Loss of elasticity means skin is losing its bounce and fluctuating hormones can still cause occasional breakouts. It’s never too late to start taking care of your skin. 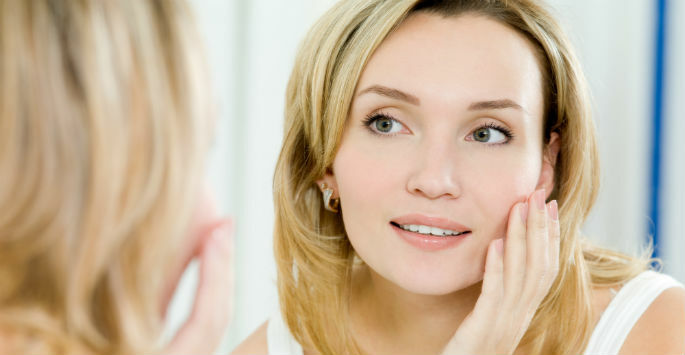 At this stage, topical treatments – combined with a healthy lifestyle – still have plenty of wrinkle-fighting promise. However, they can’t replace doctor’s office procedures when it comes to eliminating serious sun damage and sagging.